Thank You for Signing Up for the Masterclass 'Overcome The 3 Biggest Blocks to Consistently Hearing Your Inner Guidance'! You'll be sent an email confirmation soon. In the meantime, read this post on the 3 Most Common Things That Keep People Stuck And Stalled. 3 Common Things That ​I've Found That Ke​pt ​Me Feeling Frustrated, Directionless and Unfulfilled...and Far Away From A Business & Life That Li​t Me Up. So you ​want to be doing something meaningful while making an impact, right? You want​ to be 'doing what you love' because that's where 'they' said all our abundance, fulfillment and purpose lies, agreed? Or if you don't have a business, you still share the dream of doing whatever you want, when you want; of living the life you know deep down you should be living​... that life where you're getting less of what you don't want and getting more of what makes you feel alive and vital and in love with ​how things are unfolding for you. Now, I know personally know people who live that reality, so it's not 'pie-in-the-sky', that's for sure. I'm certainly on my way to that vision myself, but I didn't have the flow that I have now. I couldn't get past feeling stuck and stalled a lot of the time. So what​'s the missing piece? I bet you have an idea, because I know that you ARE self-aware and highly intuitive - otherwise you wouldn't have found me. Read on and see which of these 3 common things may be the reason you're staying stuck and stalled. They were definitely a big part of my journey. Your WHY is what motivates you to keep going, so when you’re feeling stuck in your business connecting back to your WHY can shift energy in a powerful way and motivate you to take action. Seated with your back straight, take a couple of slow, deep breaths and relax into the seat you’re sitting in. Think, feel, sense or imagine yourself back on the day you decided you were going to start your business, or embark on this venture, or choose this path. Connect with the moment that inspired idea grabbed you. · What happened in that moment? · What was it that made you realise this is what you were meant to be doing? · What was so important to you at the time that made you decide you wanted to create something impactful? Spend time in the FEELING of that moment. Stay here as long as you need to in order to shift your energy. Write down anything that came to you while you were in the feeling of that moment. Note any aha’s or inspirations, or even how you felt when you had re-connected with your WHY. There is no right or wrong. Get down everything that comes to you. Now, go and take action! 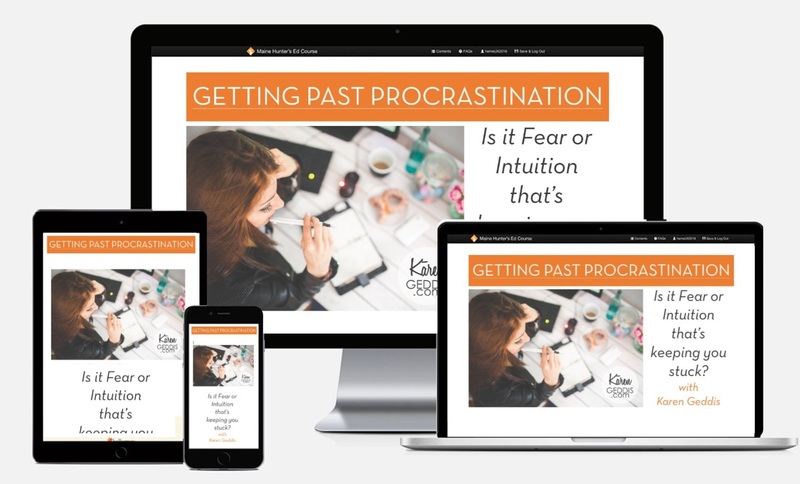 Order your copy of this unique, results-focused and transformative workshop, "PROCRASTINATION: Is it Fear or Intuition Keeping You Stuck?" today.